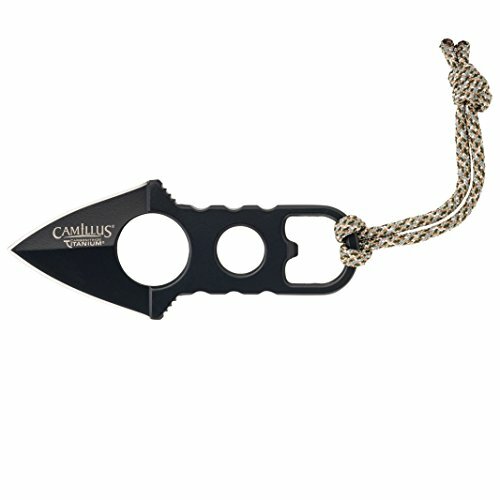 Camillus HEATER Boot / Neck Knife is 4.37" overall in length. It features a 1.75" 440 Stainless Steel Blade. The steel is bonded with Carbonitride Titanium that resists rust and corrosion and is up to 10x harder than untreated steel so the blade stays sharper, longer. This versatile knife features: a Finger Hole, Bottle Opener, Camo Paracord Loop, Beaded Chain, Molded Sheath with Belt Clip and a Lifetime Warranty. If you have any questions about this product by Camillus, contact us by completing and submitting the form below. If you are looking for a specif part number, please include it with your message.